Hey everyone! I have some more really cute valentines day nails to show you today. You might remember this post from me - hearts hearts hearts. It's one of my most popular posts! Today I have for you... hearts hearts hearts reloaded. I freehanded each one of the little hearts with my tiny brush. I love these nails. I wonder if they will be as popular as the originals were! You either make two lines that connect at the bottom to form the heart, or make two dots and then the bottom of the heart. I prefer the first method, I find it easy and quick, especially when you're doing as many hearts as I did! Good luck with your hearts manis for Valentine's Day! I hope this helps! I love this!! 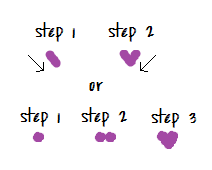 I actually wanted to try hearts for V-day, so the tutorial helps. Very cute! super cute! great how to! I love this!!! So creative and the different colours suit so well!! Ahh you're the best at freehand hearts! Keep it up. :) Great colors as well. Awful tutoroil?? I don't think, maybe more a helpful one!! You don't *need* a dotting tool, I did some hearts with a toothpick and pen dipped in polish and it seemed fine. I love these colors together! So cute! Thanks for sharing how to do the hearts! Loveet!